Concord is a town known for its history, but Doug Ellis of the Concord Corinthian Lodge recently found an artifact impressive even by Concord’s high standards. 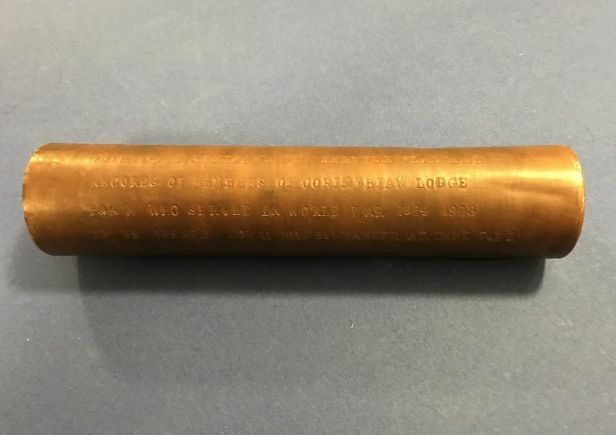 While assisting a fellow Freemason named Edwin Hancock from a chapter in Dublin, Ireland, on a research project about the 1918 sinking of the RMS Leinster, Ellis said he found a reference to a time capsule, hidden in the Concord lodge, meant to be opened this year. “I went into the meeting minutes and found that, in 1920, they gathered in a circle. They retired the service flag and they had a little ceremony for those who were lost in the war and they put together this little time capsule to be opened in 2018,” Ellis said. And with that, the hunt began, according to Ellis.